Whether you're using Kodi as a media server interface or a streamer (legally or otherwise), the flexibility of the open-source media player has made it one of the most popular additions to a home cinema setup. It has, however, stuck with a rather arcane interface for the last few years, making it impenetrable for novices and leading many to install custom skins to make it a little easier on the eye. 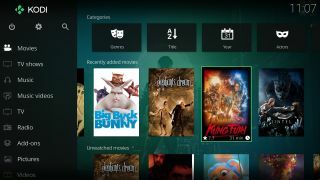 The app formerly known as XBMC has had a major makeover for its 17.0, Krypton release, however, making it more user-friendly and feature-rich than ever before. The most instantly noticeable difference is to Kodi's visual interface. It's now split into three distinct styles, suited to different devices. If you're using Kodi on the couch with a remote you'll likely want to stick with the new Estuary UI (pictured up top), which cleans up the sofa-surfing interface to make it easier to browse to your libraries of content and streaming sources. If you're using Kodi on a touchscreen device, the Estouchy skin is purpose-built for prodding, while the Chorus2 UI is best suited to keyboard and mouse input. In addition, improvements to the Kodi video engine now sees support for streaming formats including MPEG-DASH and RTMP. It's worth noting that the Android version of Kodi waves goodbye to earlier versions of Google's OS, with Android 5.0 Lollipop now the oldest supported build of the operating system. It does, however, bring with it new support for DTS-HD, DTS-X, Dolby TrueHD and Dolby Atmos audio formats, while the Windows Store welcomes Kodi for the first time. These are the best Kodi boxes to try the new update with.